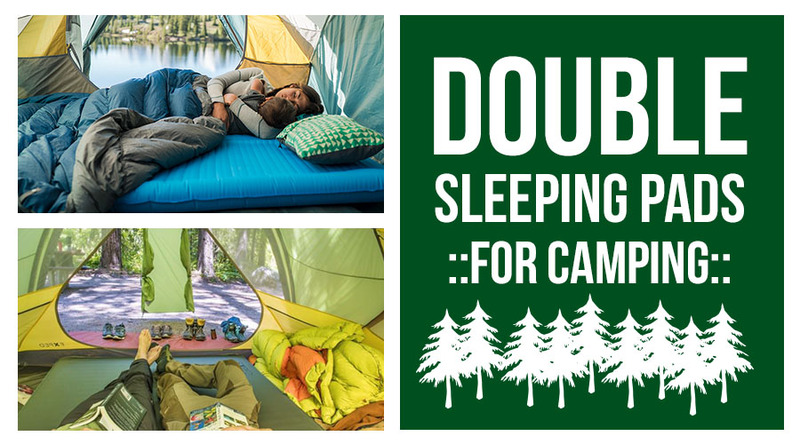 When going to the campsite as a couple, one of the most comfortable options for sleeping is a double sleeping pad. With your partner, you can greatly improve the experience of the adventure and you’d need a comfortable material to rest in. The idea is about not having to spend an uncomfortable night inside the car or somewhere less comfy. 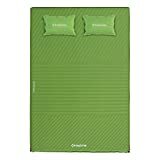 To buy a double sleeping pad which will suit best your excursion needs, we recommend following this comparative guide. 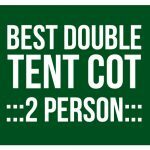 In it, you will find the highlights to consider for your purchase as well as an informative review on the best double sleeping pads in the market. If you want something higher than most pads you should check our review of best double cots. What Purpose Is It Useful For? The Exped MegaMat 10 self-inflating two-person sleeping pad is a modern model for camping. It features a 3D design which makes it an ergonomic product because it is inflated from edge to edge. It’s lightweight so you can carry it in any backpack. The queen-sized bed is great for two persons to sleep in comfort. You can use the pad in hiking, the beach or in the garden. It is considered the best couples’ mattress during camping. 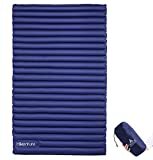 The Hikenture model is an inflatable and portable double sleeping pad which is easy to transport to camp or pack for storage. Built with the combination of nylon and thermoplastic polyurethane (TPU), this sleeping pad is highly durable. It is easy to inflate and deflate. The camping pad offers users a lot of useful options as it can be used for many indoor and outdoor purposes such as traveling, camping, scouting, and hiking. This is a 2 person sleeping pad that offers warmth and comfort added to its extremely lightweight specification. Over the years, this wonderful brand has created a comfortable, light and very warm inflatable bed and this one makes it an excellent choice for a winter walk. One thing I like about this model is that you can easily inflate it with your own air, which is great. It means you wouldn’t need creating an extra budget for a pumping device. I also observed that while one sleeps on it, there is no risk of air leakage. 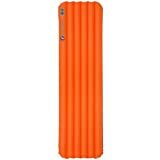 The Klymit double sleeping pad is a well-insulated four-season camping pad with an innovative v-chamber design. In comparison, it is one of the most modern models and the lightest of all on our list. It features a smart body mapping technology, which is great for stomach sleepers, side sleepers and back sleepers. The thermal mat has the property of keeping the body warm when it is in extremely cold weather. It comes with a sturdy and simple bag for easy transportation and a repair kit. Has a lifetime warranty! The Big Agnes double wide pad is a light and compact three-season accessory. It features an internal stabilizer which helps the user evenly distribute his weight while sleeping on it. 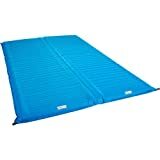 When investing in a camping mat, take this option into account because, besides being easy to inflate and deflate, it conserves heat and is water resistant. It includes a small valve that allows adjusting of the air pressure, whether manually or by machine. 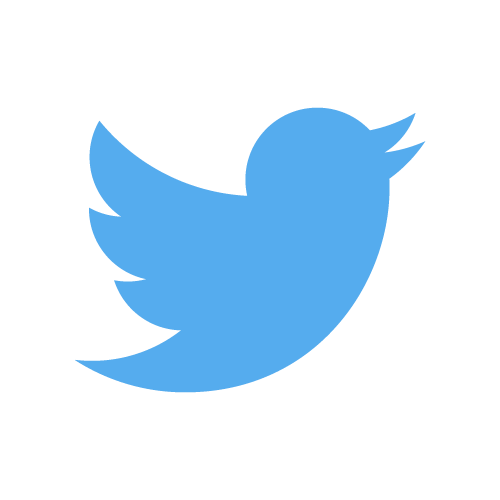 It can be used by both children and adults. Unlike other double-wide sleeping pad models reviewed in this article, the KingCamp TRIPPLEZONE is a self-inflating sleeping pad for two persons. It comes with two pillows that can self-inflate and features the TRIPPLE ZONE design, all for added comfort. To have the sleeping pad inflated, all that is required of you is to just un-valve it and it will self-inflate. It does this well in the presence of sunlight. It is 100% made of micro-brushed polyester which enhances its durability. It also comes with two compression straps and an oversized carrying bag for easy storage and transportability. You can see the video below for better clarity on what the KingCamp model is all about. The Lightspeed outdoors is a PVC-free camping air bed with a battery-operated air pump. 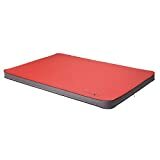 Manufactured from high-quality polyester Oxford and TPU, the air bed prevents stretching and ballooning often complained of in its PVC variants. The bed stays in good shape with no punctures or bubbles. Another thing I like about this double camp mat is that it also features a patented innovative engineering that evenly distributes weights of its user(s). It weighs below 6 pounds and comes with an oversize carry bag. There are many qualities that make these type of items great…and each also has a few downsides too! For this reason, it is important that you look for one that achieves an optimal heat, that is robust and that its weight does not generate discomfort when transported. Take into account the analysis that I present below and know a little more about what you are buying and how to use it. There are three types that are worth reviewing. Choose the one that is more functional for your use. This is the simplest among the camping mats around. It is like a cover with a little thickness of foam that prevents the body from touching the ground. Most are half an inch thick. They are those that you can inflate with your own air or with a small pump. When inflated, the pad expands and its material offers warmth and comfort to the body. These are synthetic structures with thermal insulation. They are more comfortable because the thickness can exceed two inches. They tend to be warmer, lighter and a little more difficult to inflate. Hence, you will always have to resort to the help of a small machine. Without a doubt, they are the best option for sleeping outdoors. Sleeping pads are multifunctional. But camping is the main purpose it is used for. 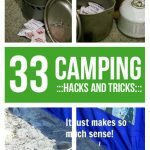 If you decide to buy a sleeping material to take camping, the size must be consistent with the space you have in the tent. You should also keep in mind the number of people who will have to sleep in it. A mattress like this is also useful to relax in the garden or maybe take a little sun on the terrace. Not everyone is lucky enough to have a guest room and it is often necessary to improvise. But if you have a good inflatable pad that is big and tall in several centimeters, you can give the guest a pleasant rest. There are inflatable models that, for height and width, are very similar to the common beds. As for classic mattresses, even inflatable ones are classified as: a pizza, a square and a half, two squares and king size. The best thing is to choose an ultra-light product so that at the time of storage it does not take up much space inside the luggage or that its weight in the backpack generates discomfort. Its weight is another important aspect to observe, as it will come in to play in its ease of transport. Those with a smooth surface are an option because they have deep baffles. In any type that you choose, make sure it guarantees comfort. The manufacturer usually indicates the temperatures that will allow you to tolerate with comfort. The size should be enough to accommodate two people without being cramped inside. If you want extra heat, make sure you have a large suspension system. All are made for that purpose but some are more powerful than others. Although you can take any position, experts recommend sleeping on your back. Either way, you will have comfort from the head to the feet. This has to do with the fact that most manufacturers give their pads a denomination according to the resistance in the flow of heat. The surface is where the comfort lies. 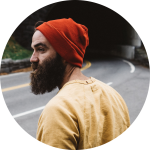 For backpackers who are active during different seasons, you probably do not worry about the surface on which you sleep. However, you must take into account that the pads are the best option, to avoid inconveniences with dirt, stones, dust, and temperature. The pads that have the greatest advantages are the inflatable ones. However, if you do it without any help from a small pump, you could compromise the humidity of the pad. Make sure to use a material that is resistant not only to the weight but to the different climatic conditions to which the mat will be subjected to so as to improve its durability. You should avoid keeping the pads (especially inflatables) with another object that can puncture it. You should wipe them with damp cloths and mild detergents oftentimes. The sound produced by these cushions when they are new may generate displeasure, but with use, it is assured that little by little, it will be attenuated until it disappears. The most popularly demanded ones are the rectangular ones but you can get some models with rounded tips. Sure, you’ll think that the thicker the better, but it’s not always like that. Consider the options that guarantee firmness without hitting bottom. The packaging is important. It should fold easily and allow reducing its dimensions as much as possible so that it can be stored in a small package or be loaded easily in a backpack while walking, mainly. 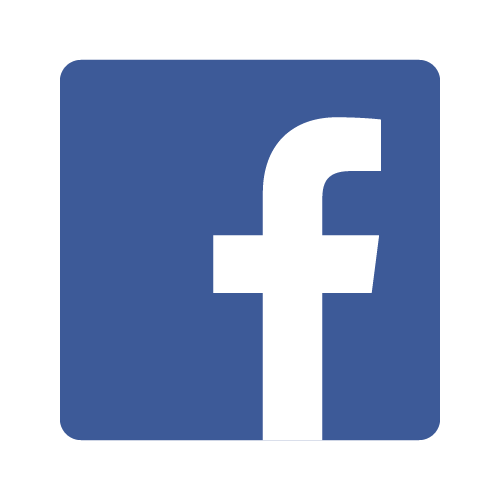 Surely, you want to choose the product of a brand that is synonymous with quality. One way to check the reliability level of a sleeping pad is to check the duration of the guarantee offered. If a brand provides a guarantee of more than two years, it is very likely that its product is of a good, if not excellent, quality level. 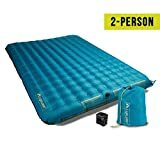 What is the overall best double sleeping pad to buy? The Hikenture pad takes the crown as the winner in the contest of the two-person sleeping pads. It is the bang for the buck. Highly durable, easy to inflate and deflate, very multifunctional, combines TPU and nylon construction and it is compact and lightweight. It checks almost all the boxes in the factors I recommended. Besides, if you decide to opt for the other 6 models, they are great and you wouldn’t regret coughing out the money. The Hikenture pad offers users a lot of useful options as it can be used for many indoor and outdoor purposes such as traveling, camping, scouting, and hiking.